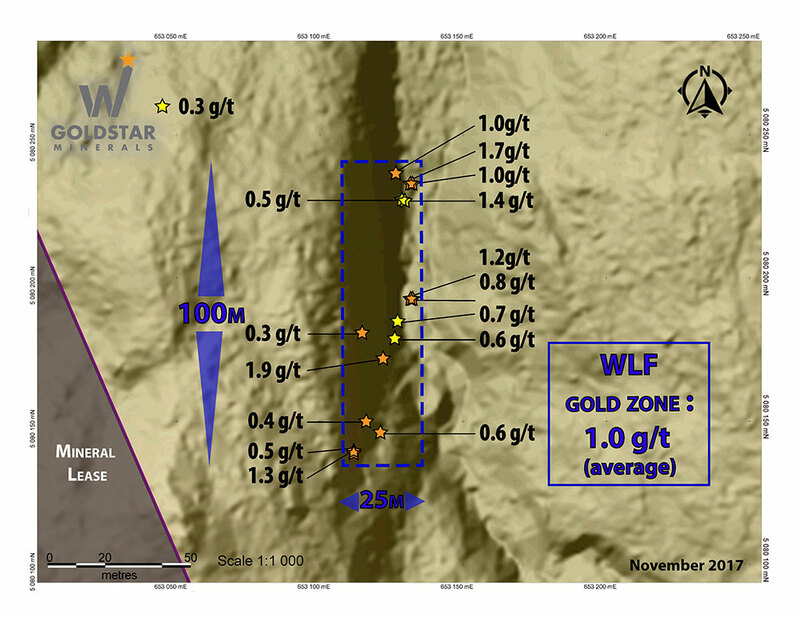 Montréal, Québec – November 30th, 2017 – Goldstar Minerals Inc. (“Goldstar” or the “Company”) (TSX-V: GDM) is pleased to announce that it has received the results of additional outcrop sampling from the WLF Zone at its Lake George Property, located in New Brunswick, Canada. The WLF zone was initially identified during field work last Fall 2016. All 16 samples from the zone are characterized by mineralization associated with strongly altered metasediments, containing finely disseminated sulfides in a sericitized and hematized matrix. Assays are summarized in the following table. Sampling of the zone has been systematic and based on available outcrop as constrained by topography. No visible mineralization was evident and all outcrops present in the zone were individually sampled by collecting random chip samples. Zone continues to be open in all directions and now established at 100m x 25m. The above samples were taken from an area 100m by 25m. The 100m axis is north/south and is interpreted to be the strike of the mineralization. The dip is interpreted to be 35-40 degrees to the east. Thickness has not been determined as work has been limited to outcropping material. The zone remains open in all directions as prospecting has been limited by thicker overburden, accessibility or other physical constraints. Late prospecting efforts in the final days of the current field campaign identified strongly altered metasediments approximately 400m south of the WLF zone. These will be sampled systematically during the next campaign and could expand the WLF zone. The geology team is presently completing the compilation of the exploration data and will update the website in the coming weeks. Additional assay results from trenching will be available in the next few weeks and will wrap up the 2017 prospecting and trenching program. Assays were performed at AGAT Laboratories located in Mississauga, Ontario using conventional Au fire assay. These are outcrop samples that are not necessarily representative of the mineralization hosted on the property. Four (4) standards were inserted every 100 metres for QC/QA procedures. No duplicates or blanks were inserted.